Nine facts and one question about why we spend what we spend to prevent sudden deaths. By Andrew CohenOur government has asked us consistently since 9/11 to sacrifice individual liberties and freedom, constitutional rights to privacy for example, in the name of national security. And we have ceded these liberties. Yet that same government in that same time hasn't asked anyone to sacrifice some Second Amendment rights to help protect innocent victims from gun violence.I'm not even conceding that gun control requires a "sacrifice." 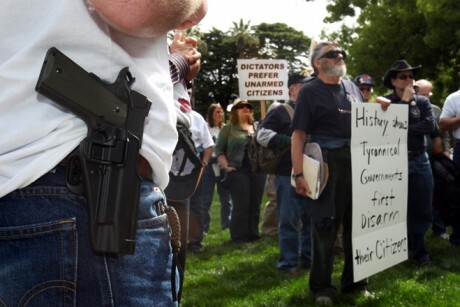 Your right is to bear arms as part of a "well regulated militia." Regulations aren't an imposition on that right, they are the right. In other words, the 2nd Amendment authorizes owning guns and accepting gun regulations. Not one or the other, both. Why are we spending a thousand times more to stop foreign terrorists than domestic terrorists? Because the NRA exists to enable the latter group of killers. Otherwise it would support rather than oppose regulations to safeguard Americans. By Alan BerlowIn a nation armed with more than a quarter of a billion privately owned firearms, the NRA is correct to assert that determined outlaws will often find a way to get their hands on guns. The problem is that the NRA is the foremost enabler of many of those outlaws. By Richard W. PainterThe most blatant protection racket is orchestrated by the National Rifle Association, which is ruthless against candidates who are tempted to stray from its view that all gun regulations are pure evil. Debra Maggart, a Republican leader in the Tennessee House of Representatives, was one of its most recent victims. The N.R.A. spent around $100,000 to defeat her in the primary, because she would not support a bill that would have allowed people to keep guns locked in their cars on private property without the property owner’s consent. 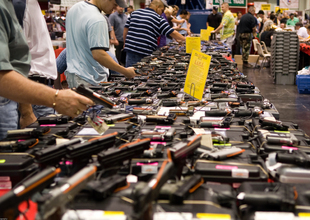 Why Isn't The Media Discussing The Unprecedented Law Giving Gun Makers And Dealers Immunity? By Sergio MunozAs major media outlets report on gun violence prevention strategies in the wake of the Newtown tragedy, they have ignored a controversial law that shields the firearms industry from being held accountable. In 2005, former President George W. Bush signed into law the Protection of Lawful Commerce in Arms Act--the "No. 1 legislative priority of the National Rifle Association"--which immunized gun makers and dealers from civil lawsuits for the crimes committed with the products they sell, a significant barrier to a comprehensive gun violence prevention strategy. Despite its recent reporting on proposed efforts to prevent another tragedy like the one in Newtown, major newspapers and evening television news have not explained this significant legal immunity, according to a Media Matters search of Nexis. By Cliff SchecterLaPierre talks of gun confiscation being just around the corner, when he knows no such thing would ever happen in the United States. The irredeemably violent make good customers too, don’t you know? So whether the NRA is working to restore gun rights to violent felons, protect the ability of terrorists, drug kingpins and serial domestic abusers to purchase high-capacity clips at gun shows, or fighting for military style weapons to be available to the Jared Loughners, John Patrick Bedells and James Holmes’ of the world, you can bet that whatever comes out of LaPierre’s mouth, his only interest is protecting the real clients of today’s NRA: arms dealers. This is made crystal-clear by the fact that the NRA’s own membership, many of whom joined only because of an outdated understanding of what the leadership of this organization actually stands for, agree with most Americans that our gun laws should protect our families, and not the financial interests of a clique of craven elites. Here are five key issues that divide the LaPierres at the top of the NRA food chain from their 3 million (or 4 million, depending upon the press release that day) members.Comment: For more on gun control, see Newtown Shootings Show America's Pathology and Time to Talk About Guns. In a way, the NRA's "guns prevent crime" message reminds me of an ancient Chinese medical text I've been reading, which prescribed, for rabies, killing the animal that bit the patient and rubbing the animal's brain in the bite. The "cure" only exacerbates the disease.